I know it’s not very Christmasy to swear so I will spare you the stream of happy cursing that’s running through my head. I just finished the last project on the “stuff I really want to get done this Christmas” list. I did it! Carol, look! I made it! No one is more amazed than I that I finished up this quilt not only before Christmas but enough before Christmas that I can actually sit under it and enjoy it for a while before it needs to be packed up. into it, seeing it twist into something new. 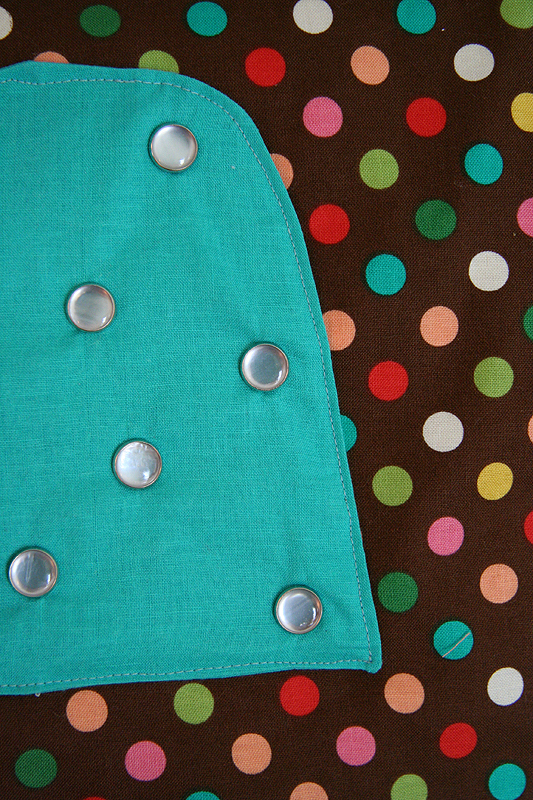 At first I was thinking how I could piece fabric together to get candy designs, then I gave up on that and went to an applique idea with lots of different candy designs on the polka dot backing. I liked the sketches but it was feeling kind of fussy, not too mention time consuming. Then I remembered one of my favorite illustrations from Richard Scarry’s Best Word Book Ever (updated to add: that I found a pic of me reading it!). Don’t know why, but this has been etched into my brain since I was a kid. So I got super excited to make a quilt with a line of gumdrops across the bottom. I thought it would look really simple and cool and conveniently, that it’d be quick and easy to do. The next thing to figure out was how to quilt it. Once I’d decided on gumdrops I wanted to do something that would make the gumdrops look sugared. I was initially thinking shell or pearl buttons that I’d sew to dot the gumdrops and then sew over scattered white dots throughout the quilt. The thought of all that button sewing was really not appealing to me though so I turned to pearlized snaps. I thought I was so clever and skipped off gleefully to the fabric store to pick up some snaps for my brilliant solution only to deflate when I realized the snapper gun thing wouldn’t make it into the middle of the quilt and the snaps were pricey. But I was too into the idea to give up on it so I bought 5 packs of 12 snaps and decided to go at it the manual way with a hammer and spool. I tried to be thrifty by using the circle on the back half of the snap for the dot snaps and the pearly ones to sugar the gumdrops. Since I was already hammering at the quilt I decided to ditch the lovingly handsewn parts to quilting and – quick quick! zip zip! – sewed the gumdrops and binding on by machine. It just got it out of the dryer (the pics are from before washing & drying) and I love it! The snaps worked to crinkle it up nicely and it fits on the sofa perfectly (which is nice since I neglected to measure it as I was cutting). I love how the cold metal snaps feel with the warm snuggly quilt and I really love how fast the whole thing came together. Immensely satisfying! So I’m going to tidy up around here a bit and then get started on the rest of my holiday plans, all of which involve sitting under this quilt…snuggling the kiddos, watching christmas movies, reading blogs, knitting, flipping through magazines, eating cookies, snoozing maybe? nope, not likely, got carried away there for a minute. That is the cutest quilt EVER! I love it! 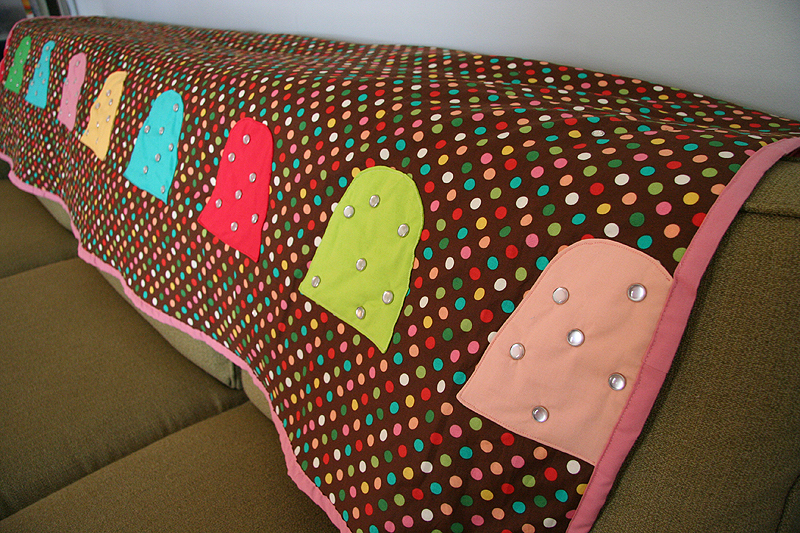 I am completely in love with that polka dot fabric, and that quilting-by-snaps is nothing short of a stroke of genius. GOT to remember that one! Really awesome job!! happy swearing? that’s what christmas is all about. i love those dots. looks wonderful. enjoy the upcoming days with it. Did you have any urges to quote the little gingerbread man in Shrek, “not my gumdrop buttons!” (or in this case, snaps)? Totally totally awesome. Great job! i just got back from picking out fabrics at a quilt shop for a project to see this genius idea of yours. genius. That is overwhelmingly sweet and cute, in such a good way!!! It’s so cute! Enjoy your family time! ooh I’ve been dreaming of alternative ways to quilt – never thought of snaps! Brilliant idea! Please encourage your brain to come up with more unusual quilts. That is awesome! I have to make one. I love it on the sofa. so cool! can I come over and sit under it? maybe we can sip cocktails and laugh the holidays on! Those gumdrops look like the Pacman ghosts! They just need eyes is all. Two kids and updating everyday and doing sooooo many crafts. Also thank you for being so generous and sharing your things with all of us. Have a very merry christmas with all the family and beautiful kids. It’s great! I love the giant gumdrops!!! Not only do I love the polka dot fabric, I love the whole quilt! Gumdrops and all. Its sounds like this was one of those great projects that stick around and make you want to “make” more. Congrats! It’s gorgeous! I love the quilt. I am amazed you finished your list before Christmas. I gotta get me some sugar! Great idea! Super awesome. I totally want one. Stunning! 🙂 Well done you! very adorable…my husband was just talking about that book this weekend, so funny! What a gorgeous quilt. Great idea about the snaps and a perfect fit for the sofa. Wow! How cute! Before I even went to the page, I knew exactly the Scarry illustration that you’d been inspired by. I LOVE that picture. Now my daughter wants exactly the same quilt, but unlike you, I don’t think I can pull it off by Christmas. Oh this is so great. I just love it. Congrats on finishing it up. I finished up a bunch of X-mas deadlines last week and it felt nice. Love it! So gorgeous!!! You are brilliant! Your “bam” saying has been my Xmas anthem too. That post made me pee my pants! So sweet! My son loves that Richard Scary book too. What a sweet quilt! Sure to be at the center of holiday memories. You have been very busy too lately! time for snugglling with the kids now! happy christmas! Wow!! So cute, really fantastic!! You are the most productive woman ever! I love to see what you’ve come up with every day. Oh my goodness, that is fabulous!! that is too freakin’ cool! i love it. That is very cute. I love the colors. Very inspiring quilt – even if it isn’t what you planned! I like that fact that it doesn’t ‘scream’ Christmas – but it does say ‘Hi, I am a holiday quilt’! Wow, that is a perfect Christmas quilt. And really smart to use those snaps! I just wanted to thank you so much for your blog. Every time I come by I feel like you’re my very crafty, very kind friend. What I love about this space is that you have an incredible talent, yet the way you write about what you do you make it seem like we could all do it (though we can’t… but we can try! And isn’t that where the joy is anyway?). In any case, thank you for inspiring and for truly, truly sharing. Happiest of holidays. That is a gorgeous quilt! You are so creative and talented. Thanks for sharing the pictures of your latest project. 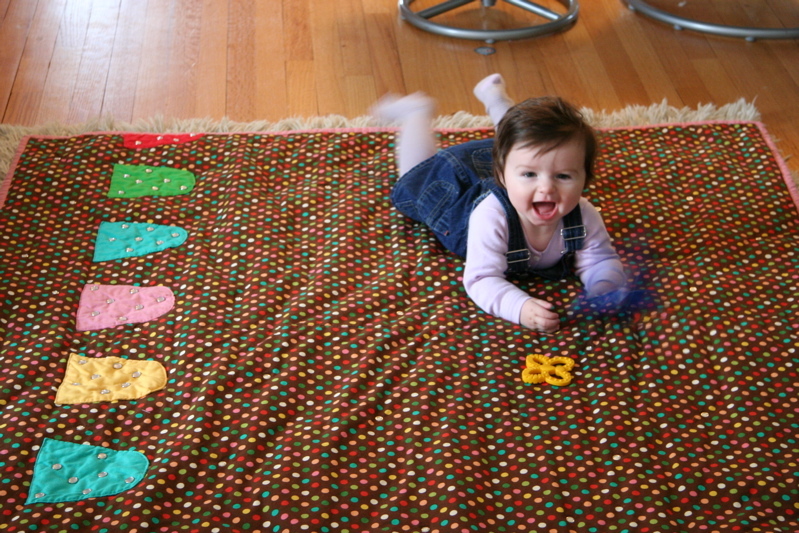 It’s a wonderful quilt–I love the whole idea of a gumdrop quilt, so very cute and clever! And congratulations on finishing it in time to enjoy it this Christmas season. Please, Please, Please, a pattern for the bonneted babies!!!! They are so adorable that I am still thinking about them! i think gum drops are for all seasons. happy holidays to you. Happy new year!!! You have not seen me here before, but from now I’ll stop by your blog as often as possible, I am from Mexico, live in the border with Texas and feel very envious of the snow in your picture, is so beautiful! we have snow only once every 100 years, the last was on Christmas 2005. The gumdrop quilt is beautiful. Wish you to have a wonderful year 2008!